Translated by Pulitzer Prize-winning author Jhumpa Lahiri, Ties is a compulsively readable and provocative novel about marriage and family by one of Italy's bestselling novelists. Like many marriages, Vanda and Aldo's has been subject to strain, to attrition, to the burden of routine. Yet it has survived intact. Or so things appear. The rupture in their marriage lies years in the past, but if one looks closely enough, the fissures and fault lines are evident. It is a cracked vase that may shatter at the slightest touch. Or perhaps it has already shattered, and nobody is willing to acknowledge the fact. Domenico Starnone's thirteenth work of fiction is a powerful short novel about relationships, family, love, and the ineluctable consequences of one's actions. Known as a consummate stylist and beloved as a talented storyteller, Domenico Starnone is the winner of Italy's most prestigious literary award, The Strega. Domenico Starnone is an Italian writer, screenwriter and journalist. He was born in Naples and lives in Rome. He is the author of thirteen works of fiction, including First Execution (Europa, 2009), Via Gemito, winner of Italy's most prestigious literary prize, the Strega. Jhumpa Lahiri is the Pulitzer Prize-winning author of The Interpreter of Maladies. Her books include The Namesake, Unaccustomed Earth, The Lowland, and, most recently, In Other Words, an exploration of language and identity. 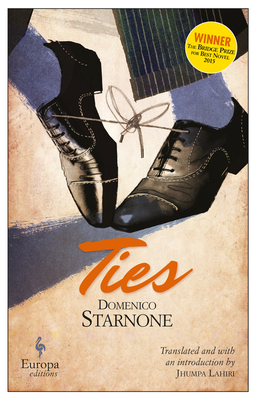 "Ties is...the leanest, most understated and emotionally powerful novel by Domenico Starnone." "Ties is puzzle-like, architectural, a novel ingeniously constructed." "Ties is a masterful study of passing time." "[Ties] is as vivid and devastating as anything you will read this year. A slim, stunning meditation on marriage, fidelity, honesty, and truth." "Absolutely gripping from start to finish... a really stunning book." "The story glints and cuts like smashed crystal." "A superlative novel, Ties offers an x-ray image both of love that is love in name only and of destruction, specifically a home torn apart by something that at first seems to be a tornado but turns out to be Starnone's brilliant writing." "Ties is a masterfully crafted synthesis of Starnone's storytelling technique and prose style." "Ties is not simply a novel about a couple in crisis, but a work of literature where staged scenes featuring one's unrealized self are propped up by the indestructible scaffolding of marriage." "Starnone renders narrative time telescopically as well as microscopically, so that fleeting moments expand and entire decades contract within the same paragraph. [...] And this is the book’s highest achievement: the novelist’s agile handling of time expresses itself in his characters’ agony."